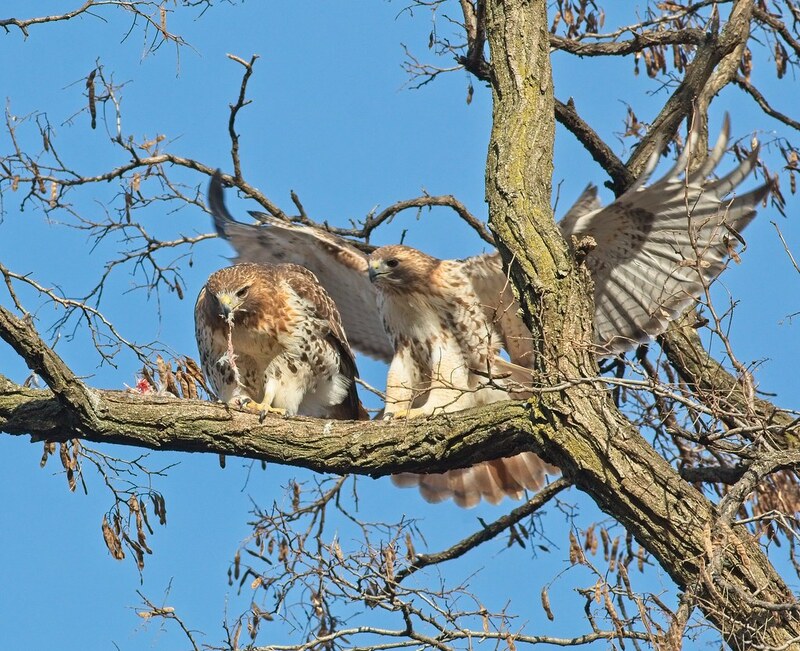 This week, red-tailed hawks Christo and Amelia have been continuing their bonding activities by nest-building and mating. 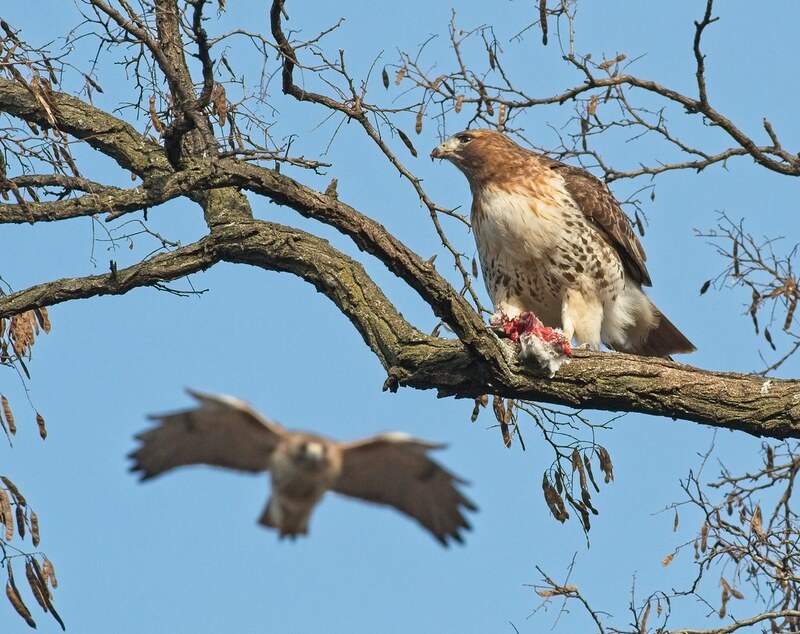 Christo has been giving Amelia food and they've been spending more time in and around the park. 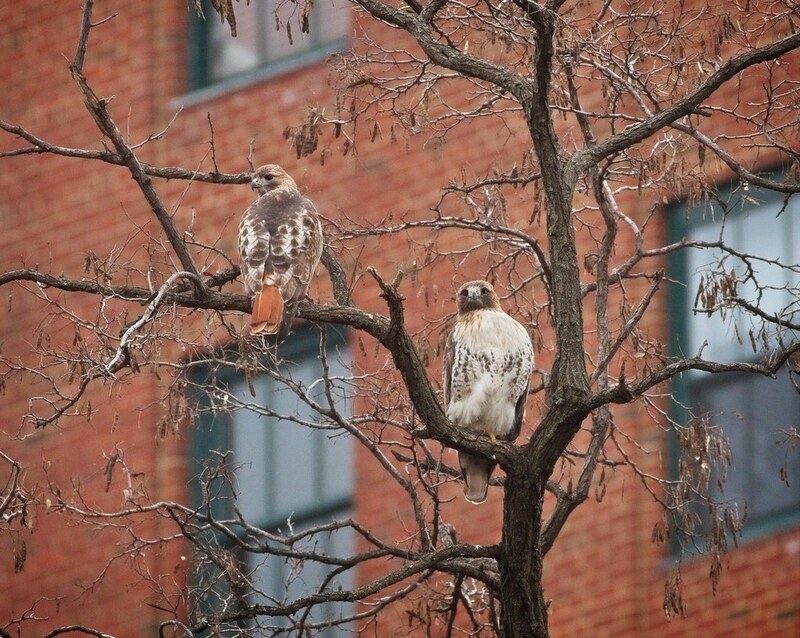 Below, Christo and Amelia keep an eye on things from one of their favorite perches near Avenue B. 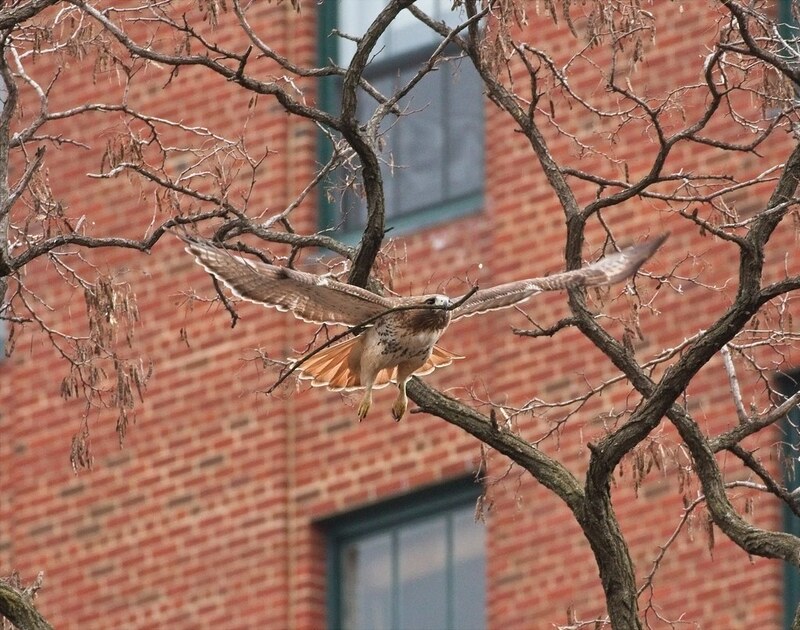 She flies the stick towards the nest. 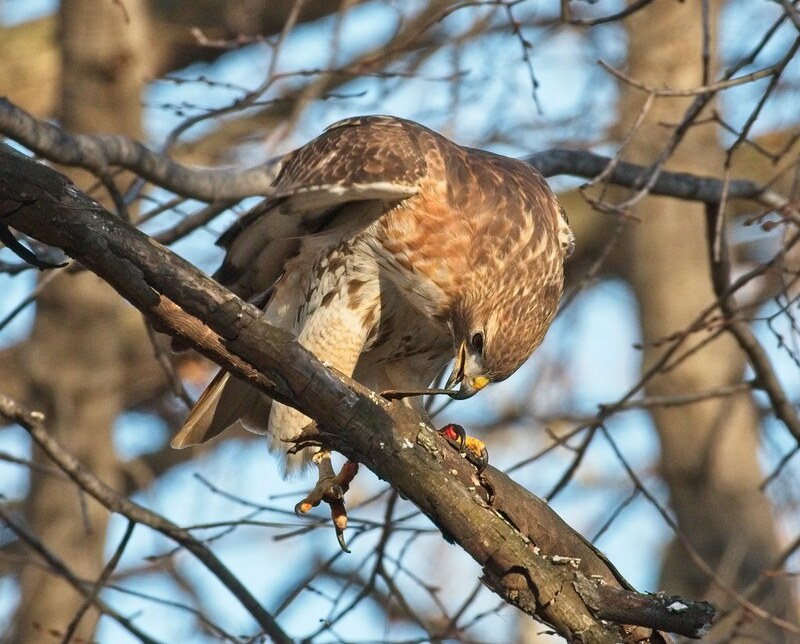 I love watching Christo peel bark from trees. 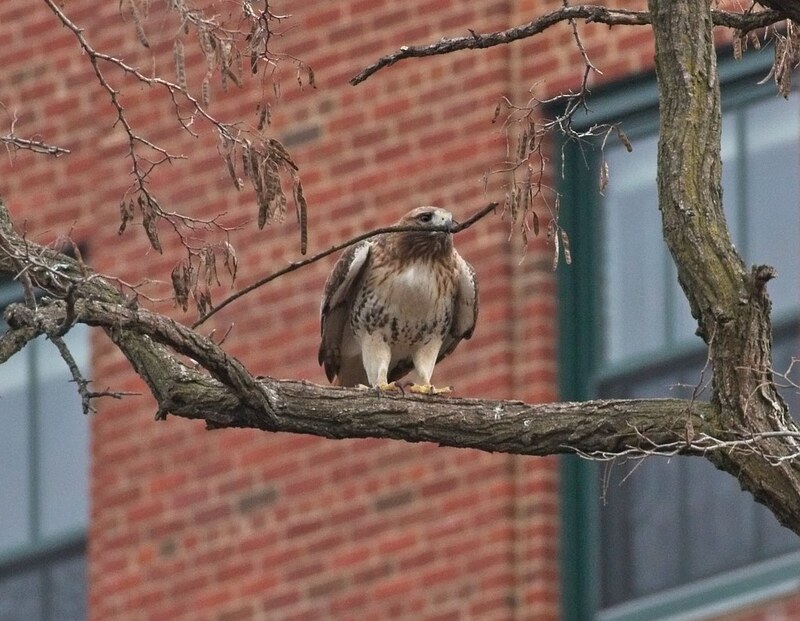 He seems to prefer bark from Chinese Scholar trees as well as American Elm. 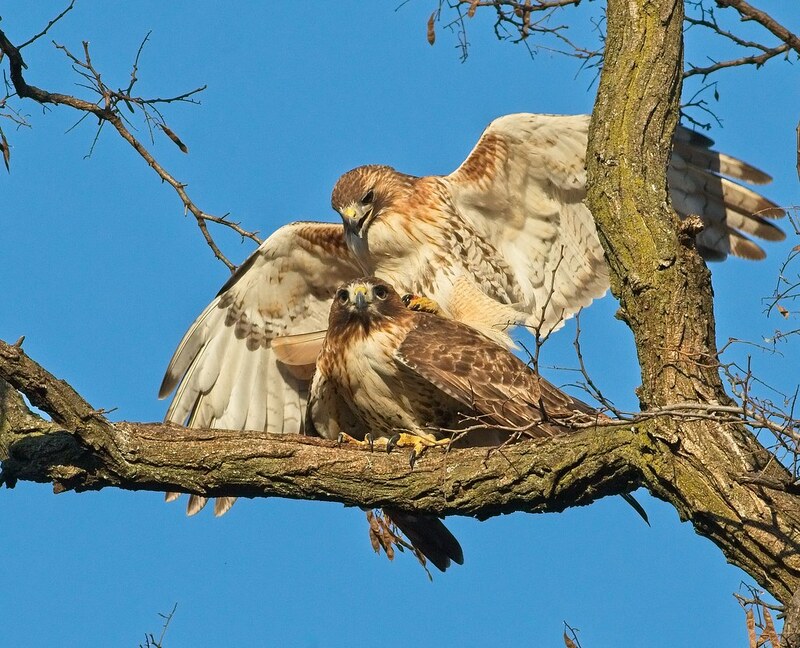 The hawks use the bark to line their nest. 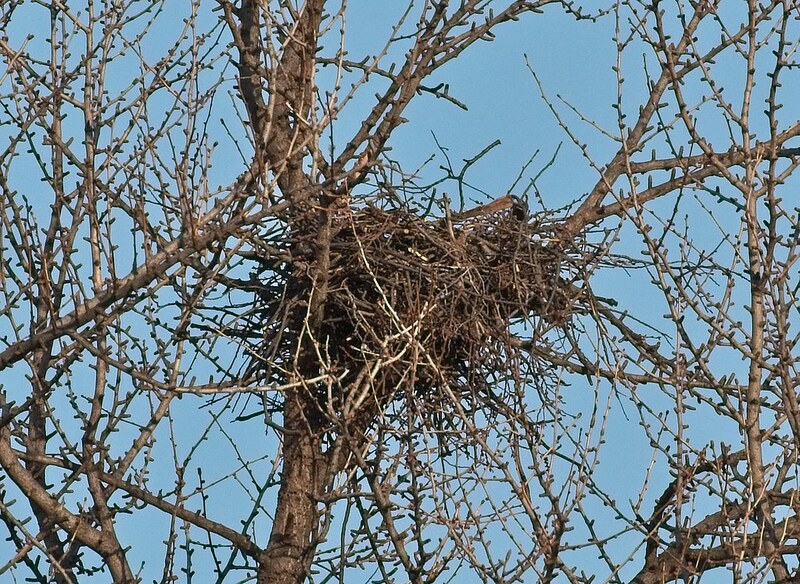 Below, a piece of bark can be see laying across the top right side of the nest. 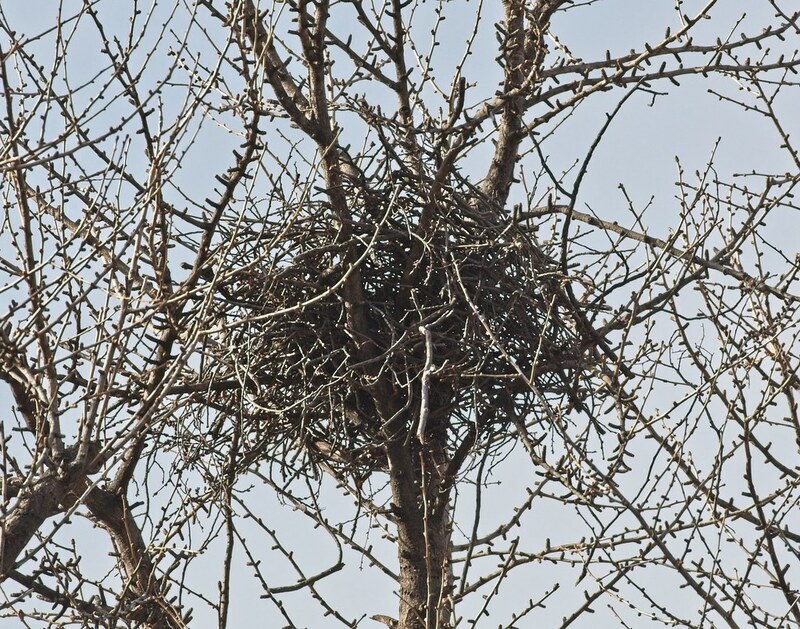 When they're not nest-building, Christo and Amelia can be seen (and heard!) 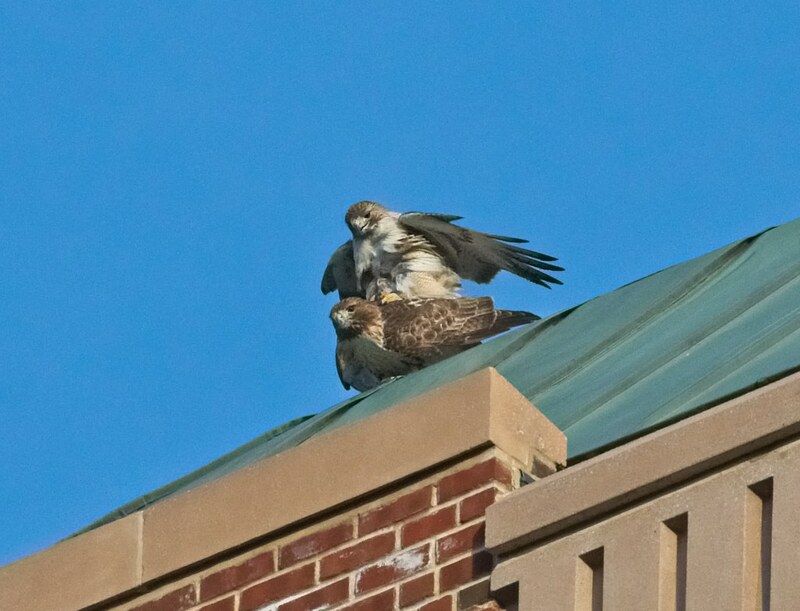 mating. 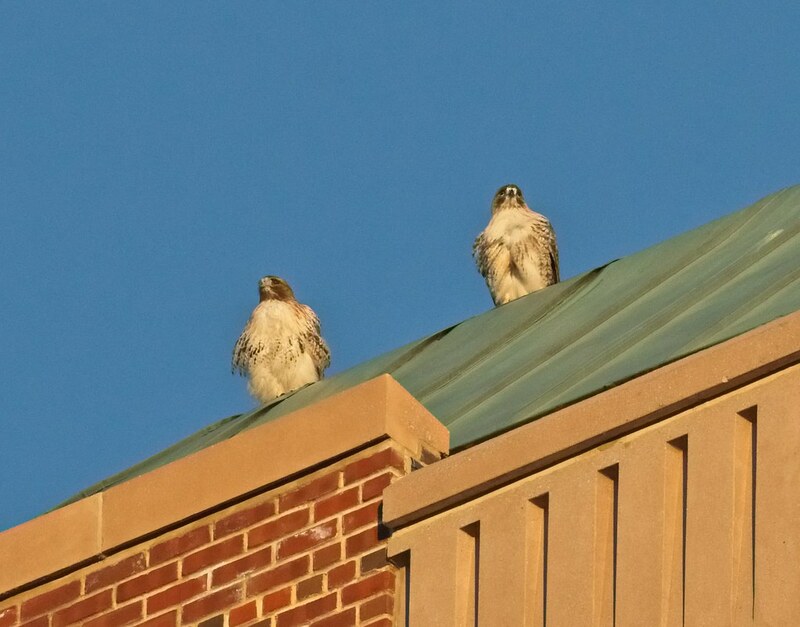 Here they are on the roof of the Christodora building on Avenue B and 9th Street. 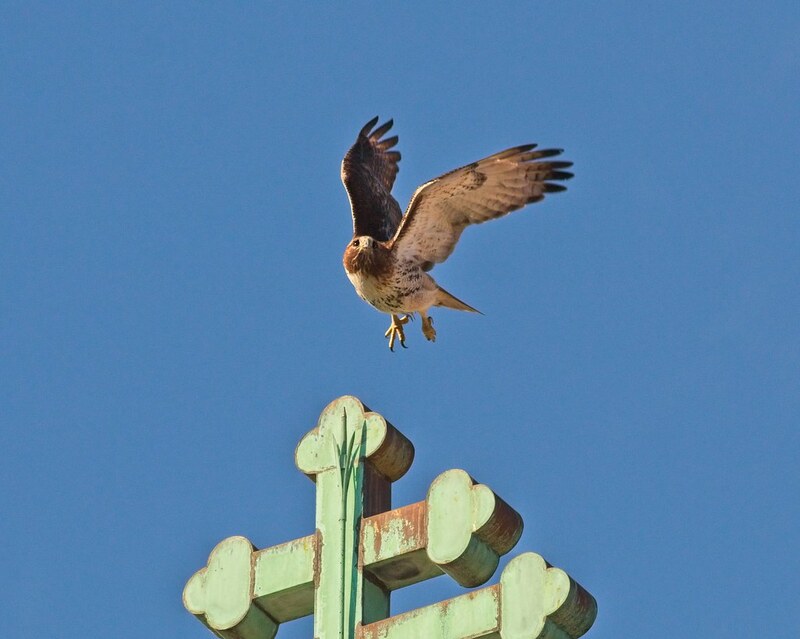 She soared past me, on her way to Christo, who was calling her for dinner. 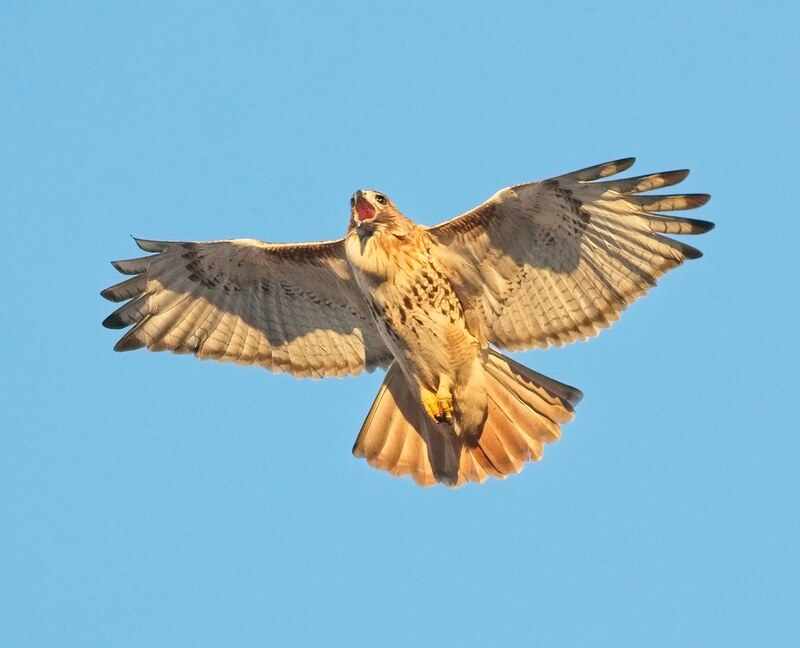 Just after sunset, a kestrel flew over the hawk pair as they watched over the park. 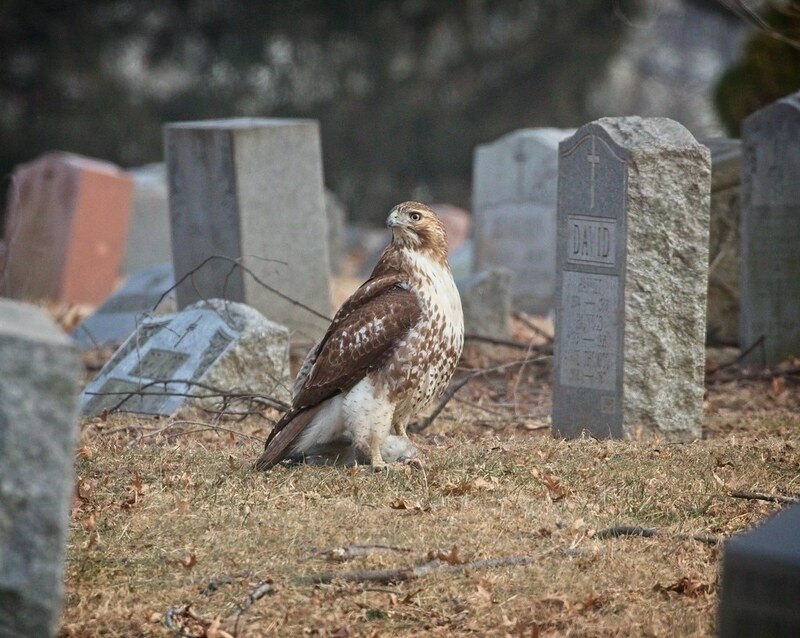 You can see more recent hawk photos on my Flickr page. 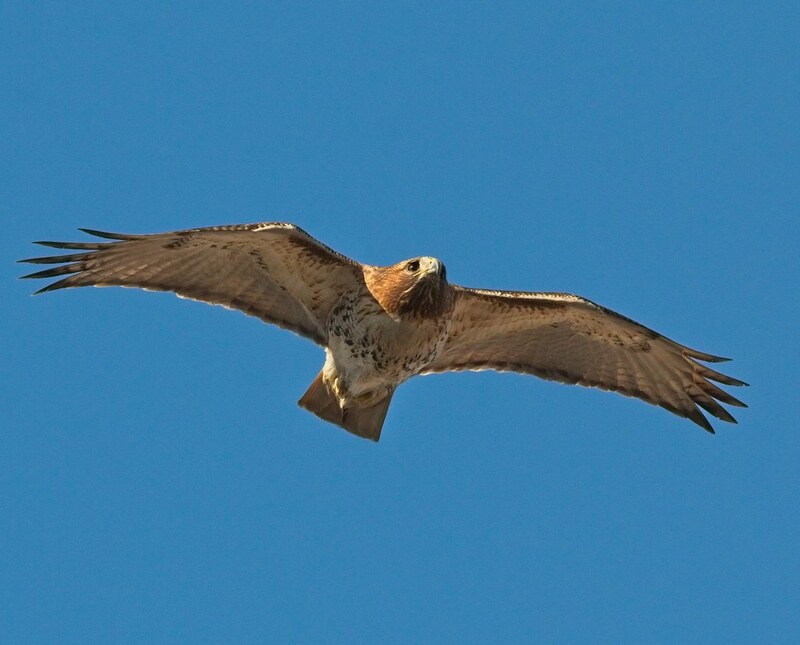 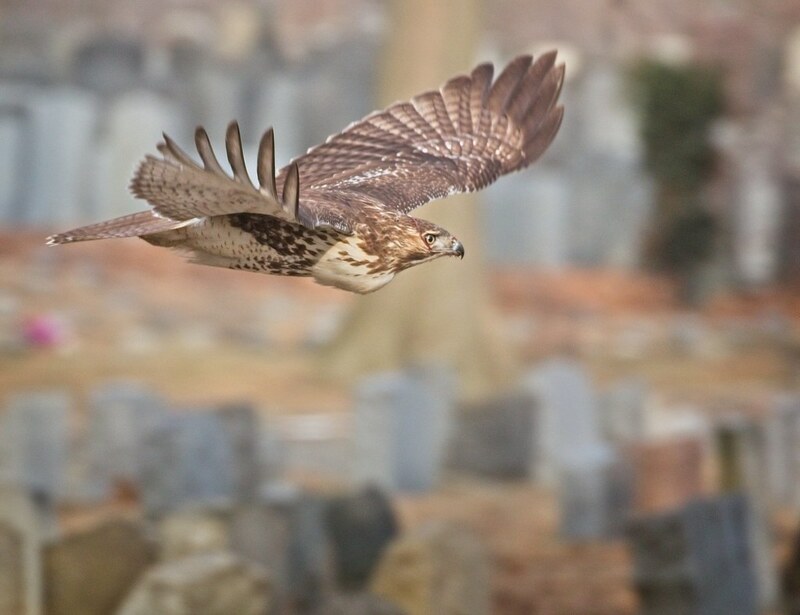 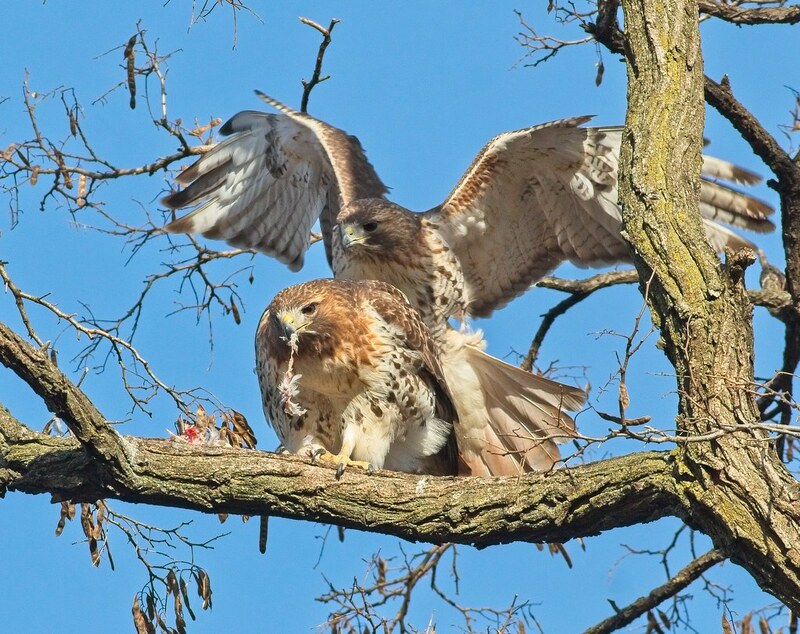 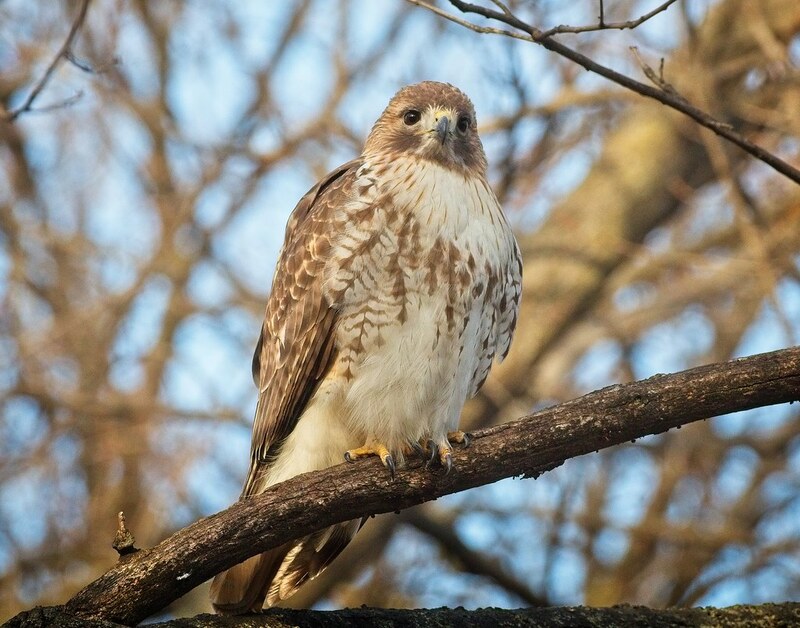 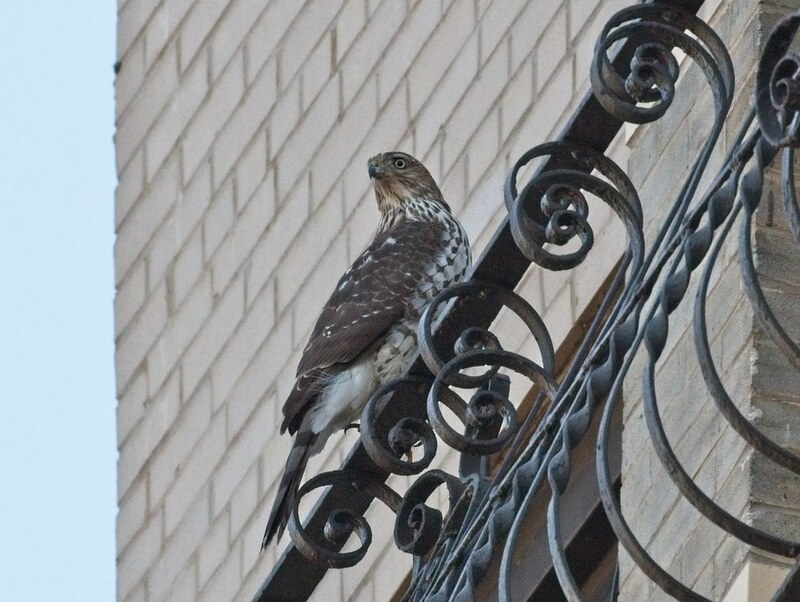 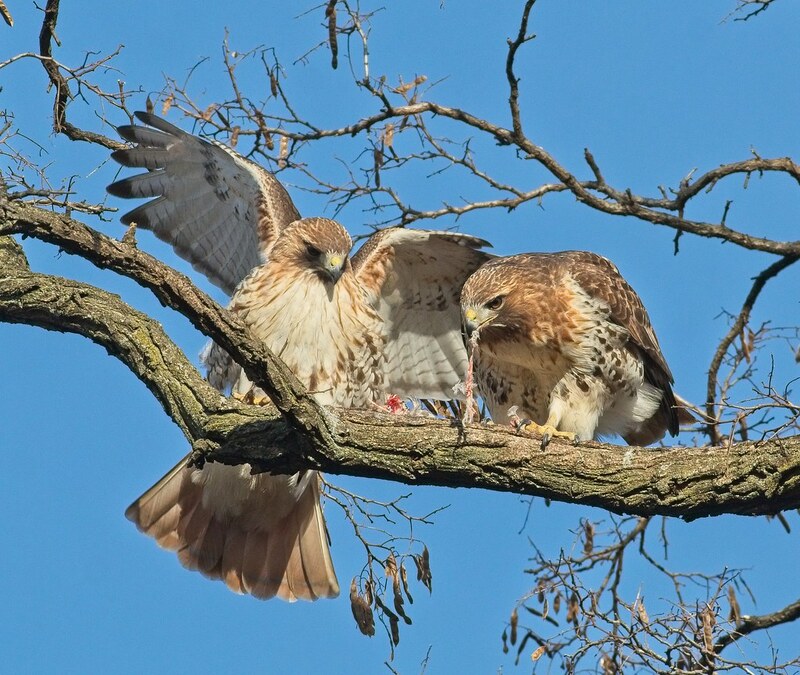 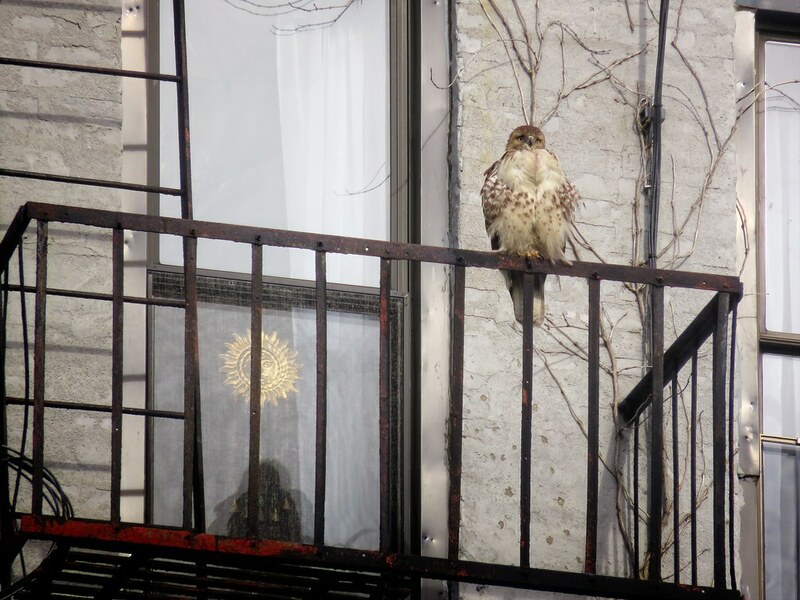 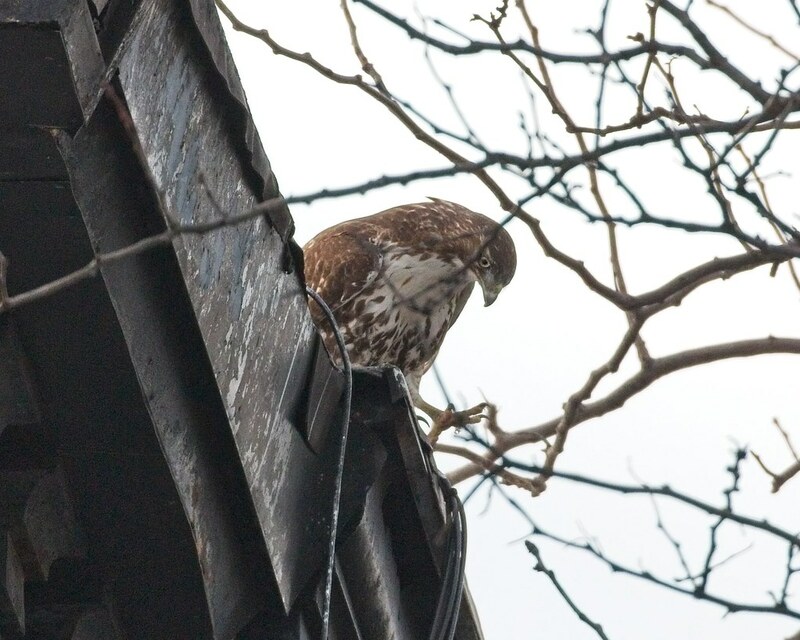 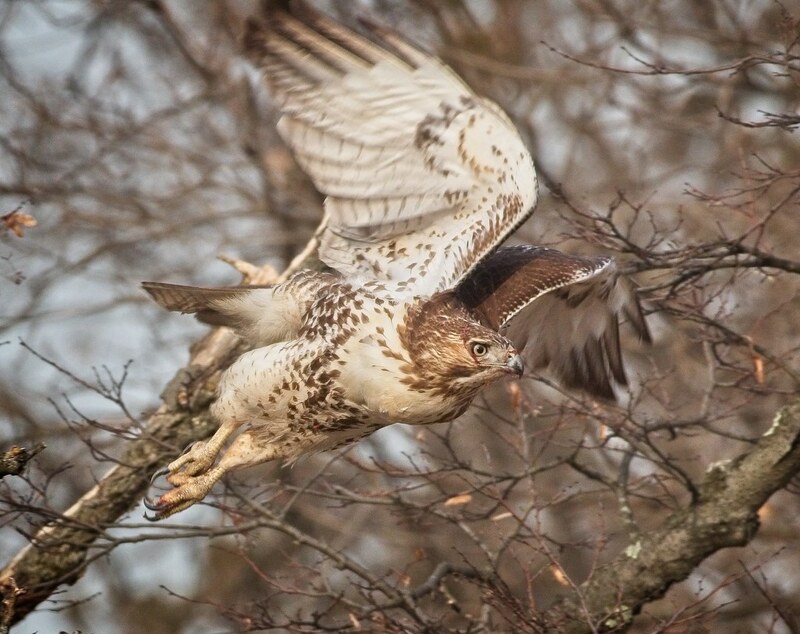 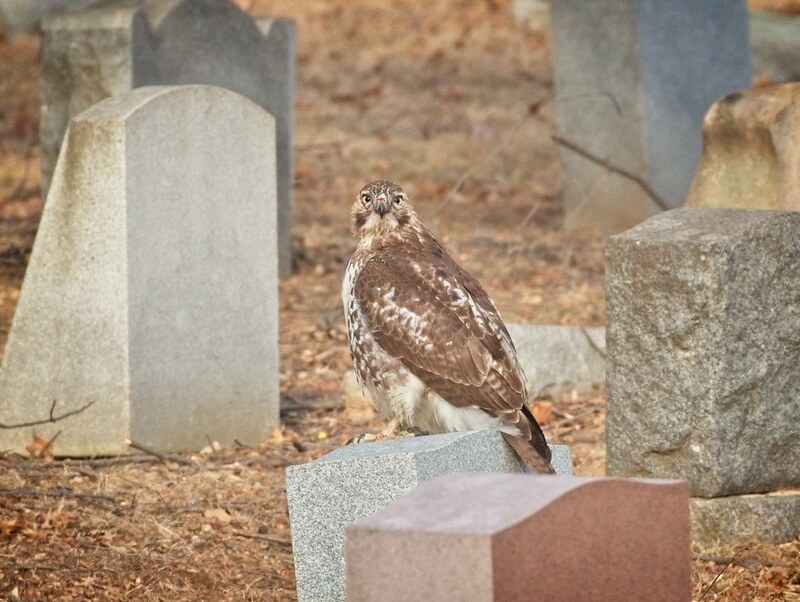 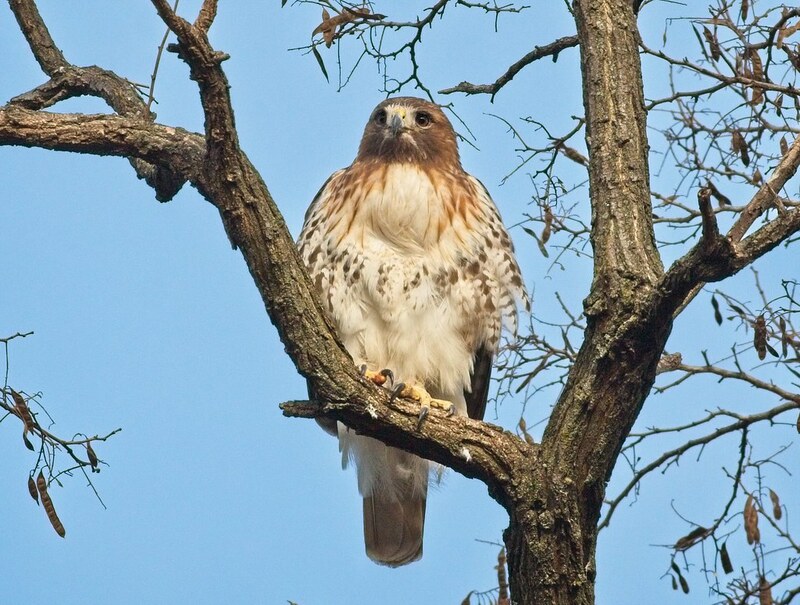 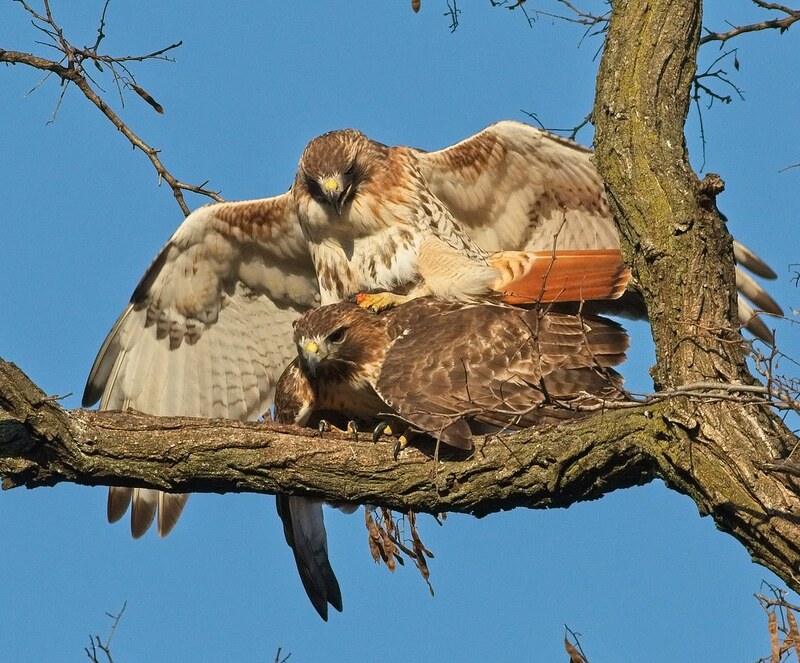 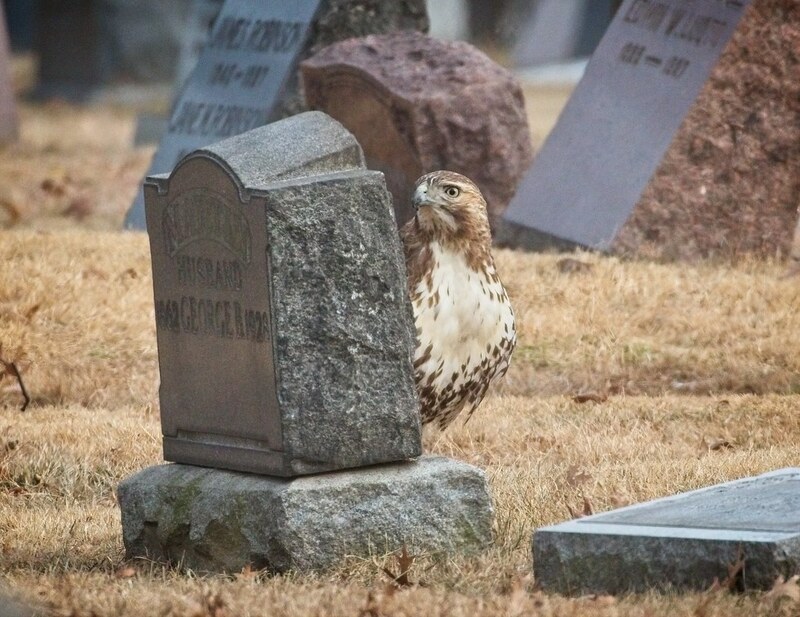 Right on schedule, Tompkins Square red-tailed hawks, Christo and Amelia, have begun mating. 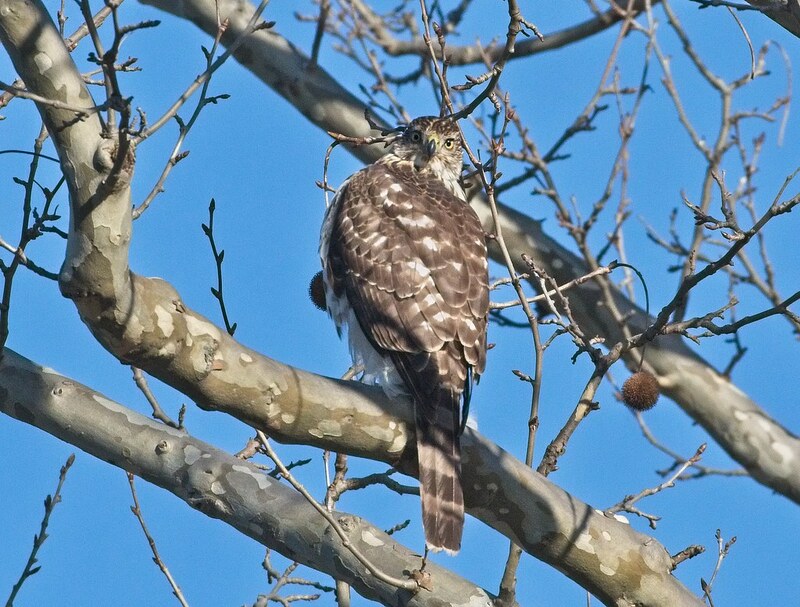 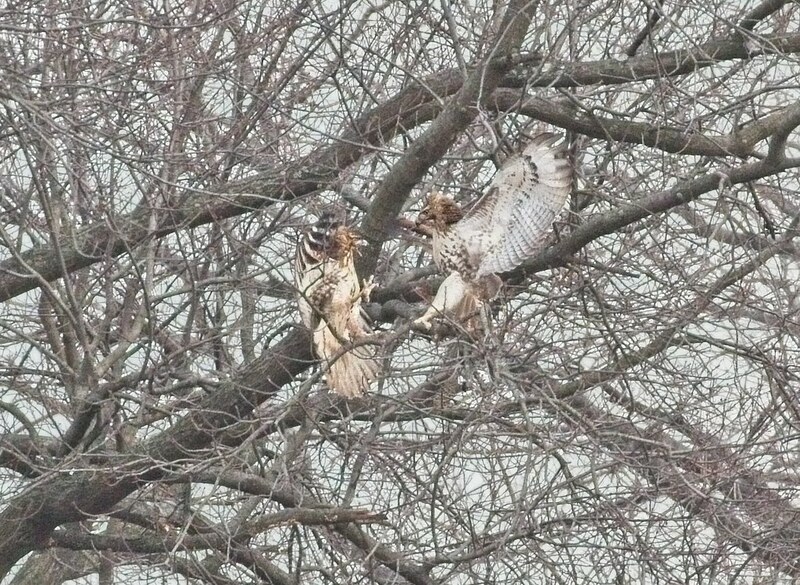 A fellow hawk-watcher caught them in the act on February 13, and they were seen mating again on Valentine's Day. 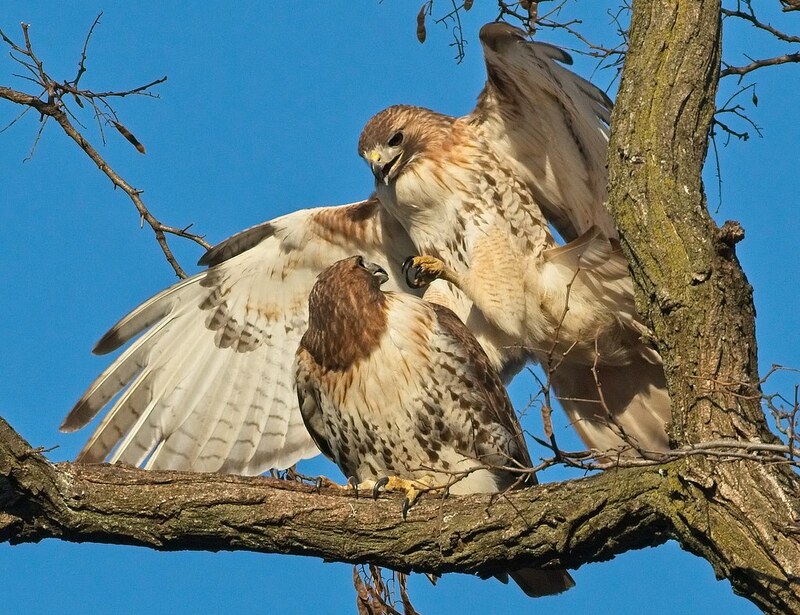 We can expect to see an increase in mating activity over the next three or four weeks, with egg-laying expected in mid to late March. 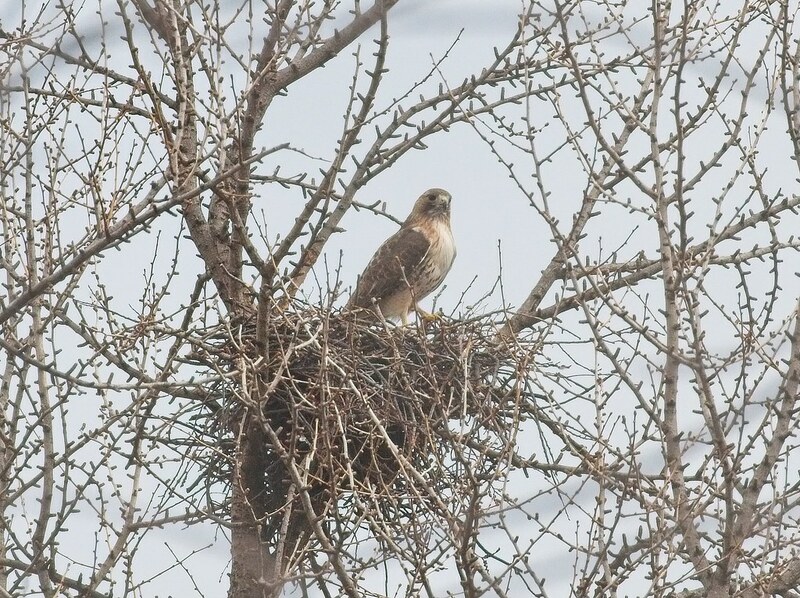 In the meantime, the hawks are making progress on their nest. 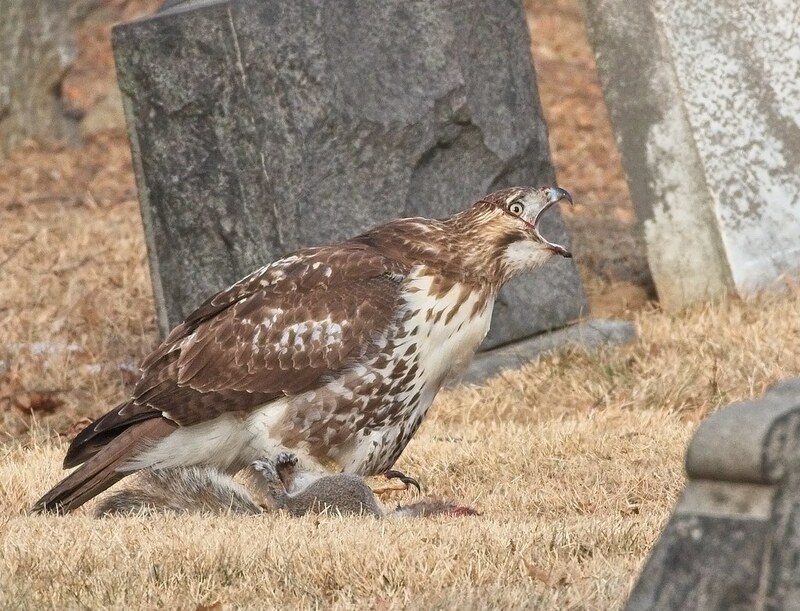 On Sunday, I caught Amelia chowing down on a pigeon. 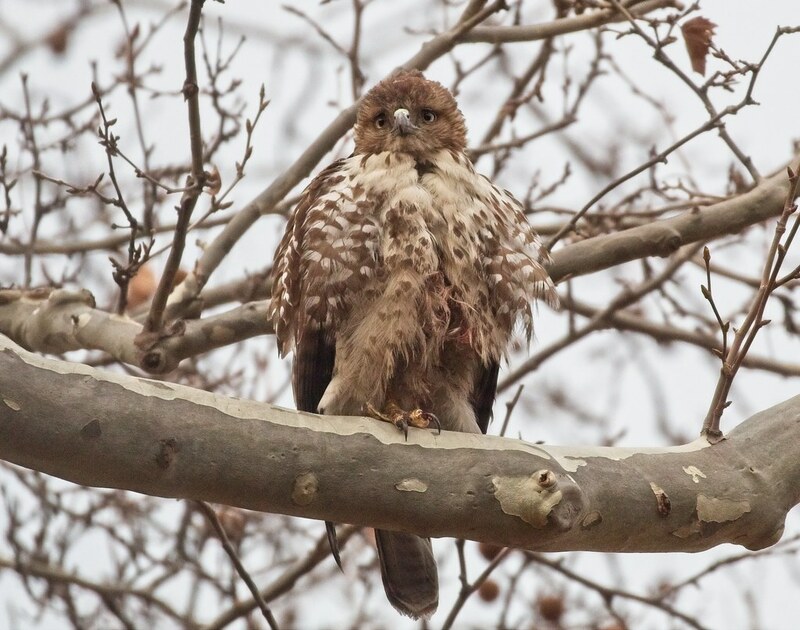 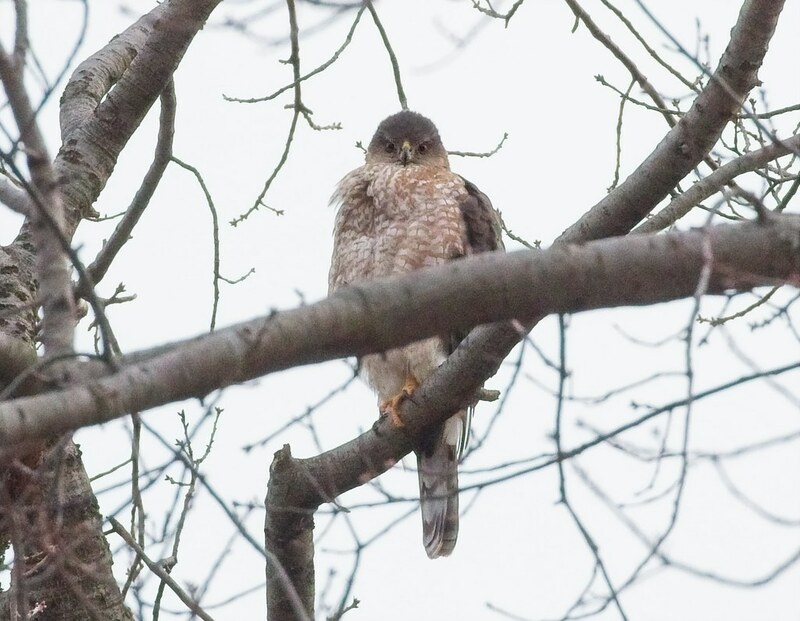 She's an impressively large hawk, but with a full crop, she appears even bigger. 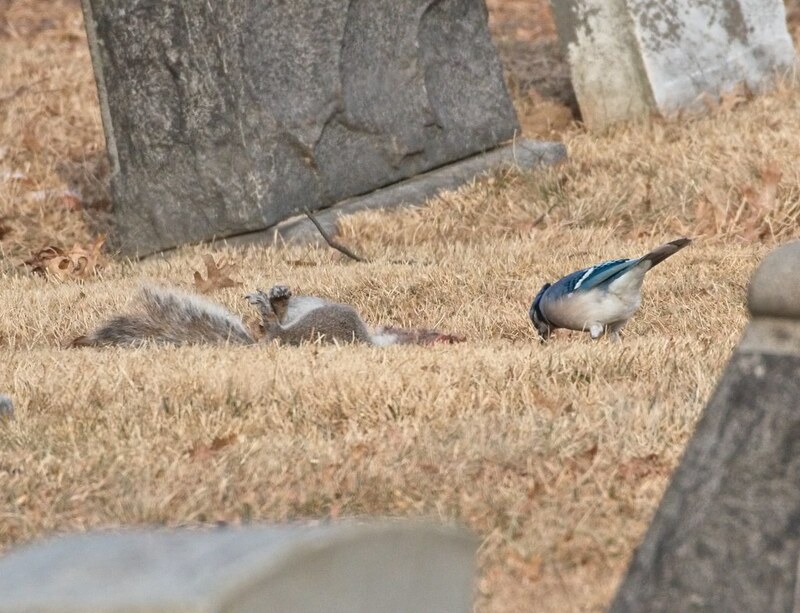 As she ate, Christo snuck up behind her. 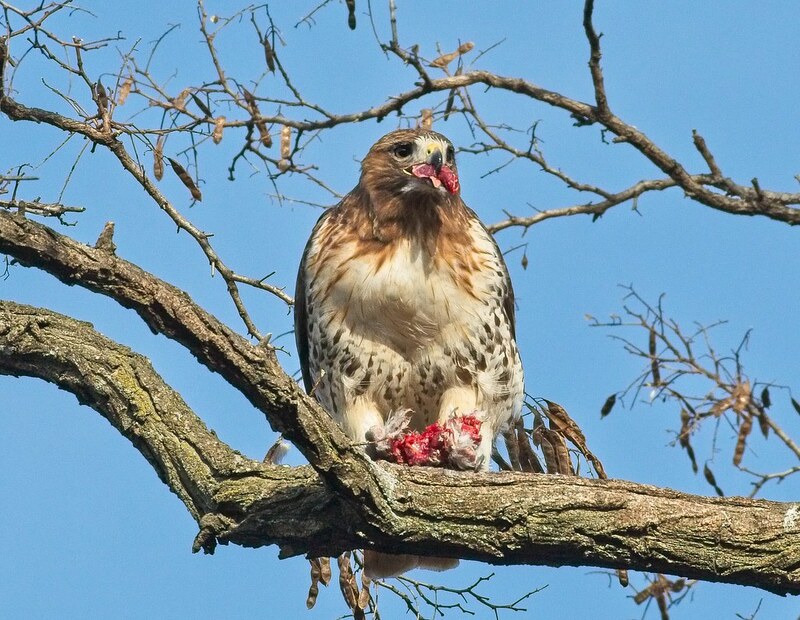 Amelia scarfed down the last bit of food just as he arrived. 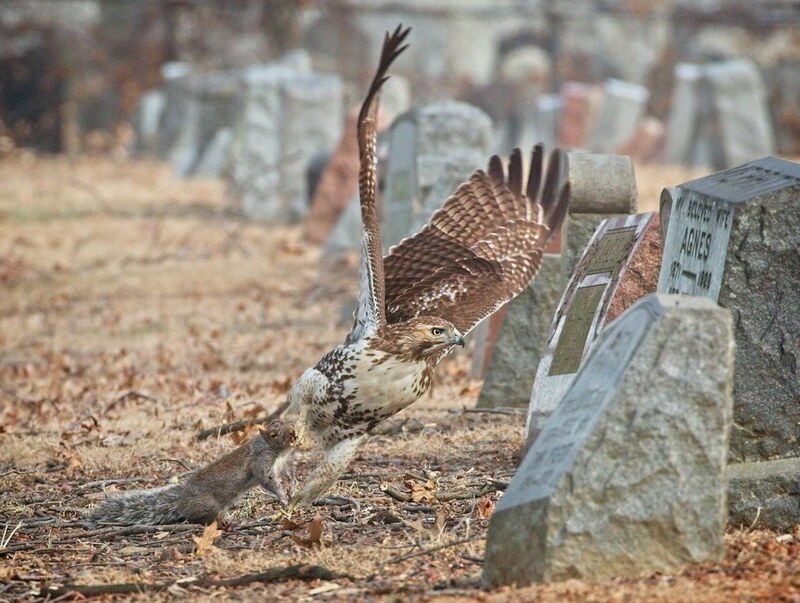 Dinner was gone, but no worries as Christo went off to hunt for himself by lamp light. 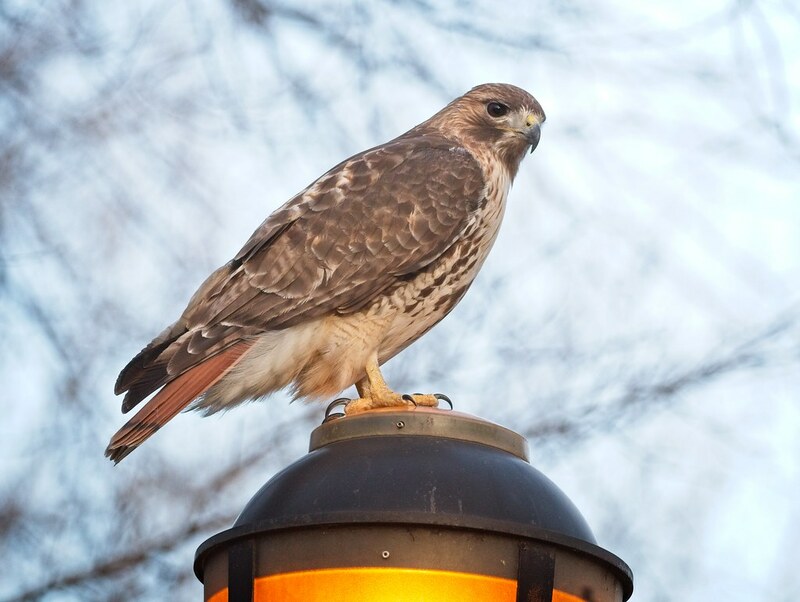 We've seen him do this numerous times - using the park lights to hunt for rats as they come out at dusk. 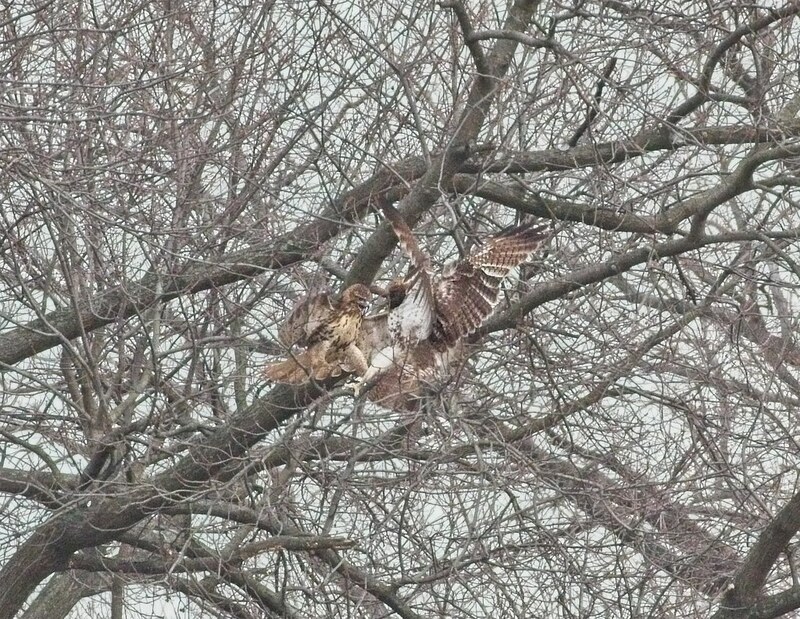 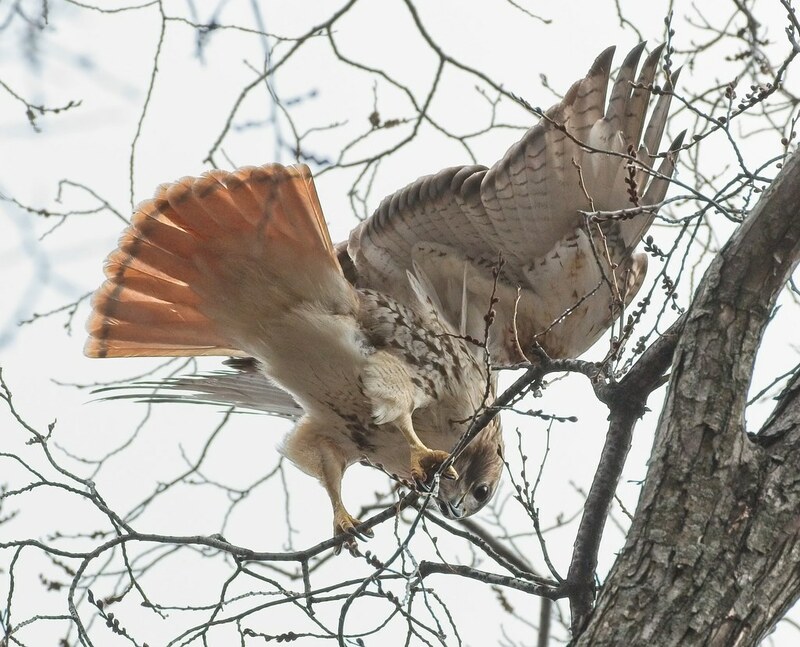 On Tuesday, the hawks were plagued by an intruding immature red-tail, so Christo took after it, screaming. 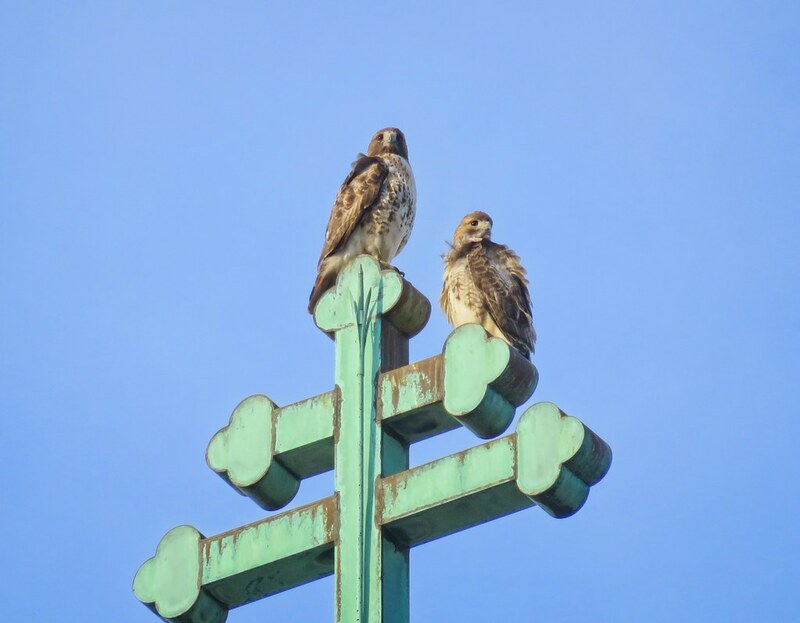 Below is a video of Amelia and Christo keeping watch over the park from one of their favorite perches on Avenue A. 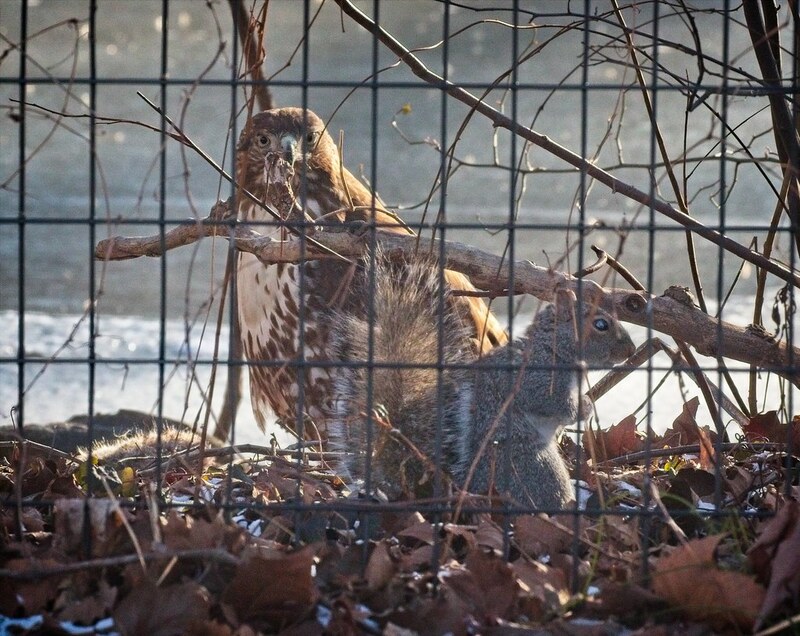 All seems well in East Village hawkland, and I look forward to seeing more activity from this pair.